Often important elements of an email creative are overlooked; resulting in a negative impact on your campaign performance. 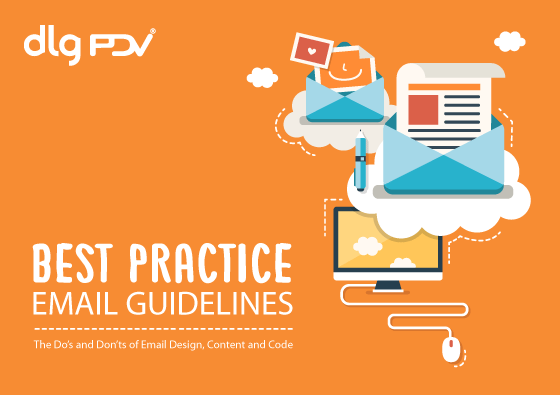 DLG and PDV have tapped into years of expertise to develop a must-read Email Best Practice guide. It highlights the do's and don'ts of email design, content and code. Helping you avoid their many pitfalls, hurdles and challenges, to create successful and compliant email creatives. Targeting your audience with relevant content from subject line to email copy. Making the best use of imagery in email and the challenges they face. Elements of a creative which can trigger spam filters and how to work around them. Anatomy of an engaging email creative to drive open and click-throughs. The art of coding email creatives to avoid rendering, spam and deliverability issues. Creative compliance required by the PECR, CAN-SPAM Act 2003 and other email marketing laws. Start optimising your creatives for email marketing success; simply complete the form to download our Email Best Practice guide. By clicking on the button below, you give permission to receive details about our products and services by email, telephone and/or SMS from Data Locator Group Ltd (DLG) and PDV Ltd. If our guide fails to automatically download, please check your email in a few minutes to download it from there.